So, is there any way I can make this look better? You betcha! Check this out!! Yes, I know, I know. It’s totally awesome. Don’t hate! I’m gonna show you how you can make your own. YOU CAN DO IT. This project is EASY. First: Wash the bottle out really well (I pored the soap into a little dish while I was prepping this craft). Also, use some Goo-Gone to remove all the stickers. Third: Spray paint using paint for PLASTIC stuff. Is my paint setup looking familier? Yes, this project dates back to my When Bad Ideas Happen to Good People post. Oops. So I wasn’t lovin’ the solid black look so once they were painted with the plastic paint I added a coat of regular ORB (not made specifically for plastic). I had tape around the top so if you look closely you can see the difference that ORB makes. The top is NOT with ORB, the bottom part IS. Kapish?! 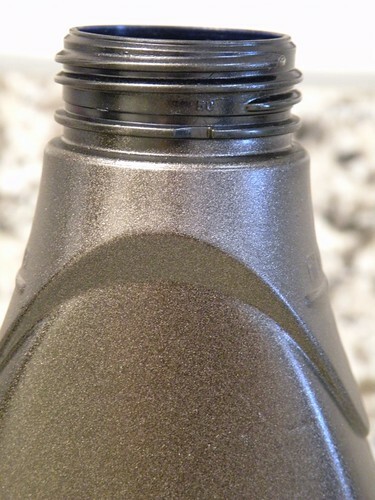 Also, I wasn’t feelin’ the solid blackish ORB look either so I used a brownish metallic for the top pump part. It’s hard to tell but the pump and the base are two slightly different colors. It gives just enough contrast. 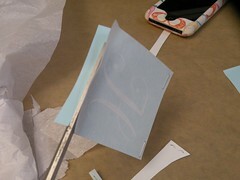 And now, another tutorial on how to apply vinyl letters. From L to R: Remove staples. 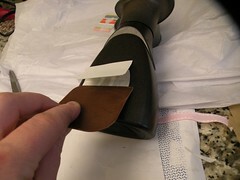 Trim off about a 1/4″ of the backing. Position your letter exactly where you want it. It should stick at the bottom where you removed a section of the backing (I do this with bumper stickers too. It helps to get it placed perfectly w/o bubbles). From L to R: Get the vinyl positioned exactly where you want it. 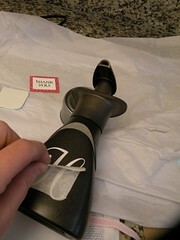 Slowly roll the backing off the sticker as you smooth the sticker onto your surface. Once it’s applied smooth it out really well with a scraper. 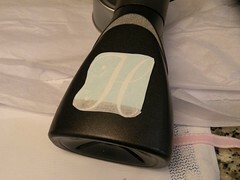 Now Slowly peel off the top sticker layer revealing only the vinyl. Now go and craft something great and show me your results!! Do you recognize that little glass jar with the jelly beans? It’s from my Keepin’ Myself Busy post. A little dishwasher action and now it’s an adorable little candy jar… that is until I think of some cool craft for it. And just for fun, I <3 vinyl! I found you via FF and am following. I’m also bookmarking you LOVE this. Super-cute, Allison!!! Love your craft ideas! Good grief. That is SO CLEVER!!! But tell me please, what is this ORB you speak of? It looks like such a cool texture! I’ve got three bottles uglying up my sink (dish detergent, lotion, soap), I need to give them this treatment! Looks very classy and chic. LOVE LOVE LOVE it!!! I just might have to steal that idea. Looks great! you did a fantastic job – love it! I’ll bet it holds up well. I love this, just like I loved your knife block project! I must get some initial letters. 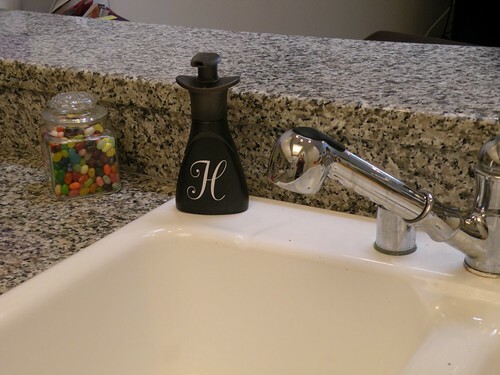 I definitely want to do this to my bathroom soap dispensers ~ bring them up a notch from their plastic-ness! Wow, I love the outcome. That paint is awesome! I adore this….I will definitely be borrowing this idea. You are scary! I hate looking at my soap bottle too but I think to hide it not paint it!!!!! But I do have a spare can of spraypaint in the laundry room right now …. Fabulous! Spray paint and a vinyl decal can create magic! fabulous, now something must be done to my Dawn bottle!! Oh! 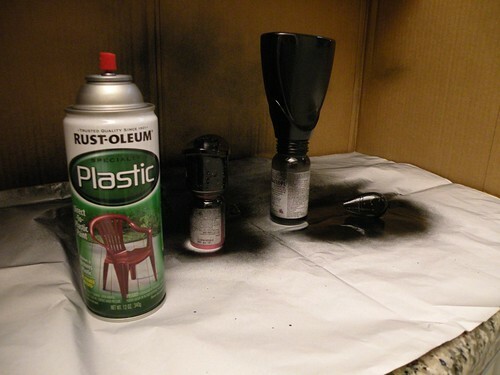 Spray paint for plastic….now I know what I did wrong! Love your soap makeover! 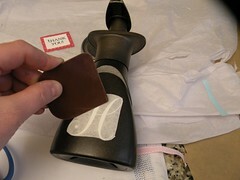 Wow girl – that looks much better than my nasty ole bottle of soap! Thanks for the great idea! Please come plant your creative seeds at my blog party on Friday “Plant a Punkin Seed at Punkin Seed Productions”. Love this!!! It looks so much better than the plain old soap bottle. Okay, I am really trying not to hate you! lol! LOVE, LOVE, LOVE!!!! OMG it so cool!!!! I will try it soon, Thank you for sharing the cool idea. That is SO awesome and looks soooo great! NO WAY! This is perfect! I have always rolled my eyes at how tacky my foamer is – all bright in my warm colored kitchen. I started laughing when I saw what you did with it! Nothing is safe in your house! Great project! Whoa, that is so nice. I love the matching monograms! That is such a great idea! I just started my blog and it’s all about cleaning. This would be a fantastic tip to share with my readers. I may just have to link to you! Love it! Looks great! How does the plastic spray paint hold up to water? I have that very same soap dispenser @ my sink. I would have never thought to paint it. Very clever!! Where to you get the vinyls? I have to order online. @Carolyn I hope it holds up! So far so good. I’ve washed it off several times and it’s been great. Wow. I love ORB spray paint, too, though I only discovered it a week ago! 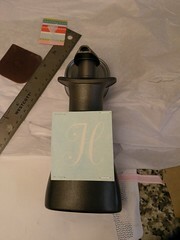 I posted about what I sprayed, too- a light fixture, brass lamp, and plastic trash can. You are really good with the spray paint!! All your ideas are really clever and thrifty…love them all. Thank you for sharing and bringing your hodgepodge to my party. I love seeing what you are up to. Hope to see you again. Oh my Gracious! You are freakin’ brilliant! ADORABLE! How creative! You’ve made such run of the mill trinkets absolute must haves. Love this! Thanks for linking up to SNS #24! won’t the paint wash off after a while? that is why the questions. 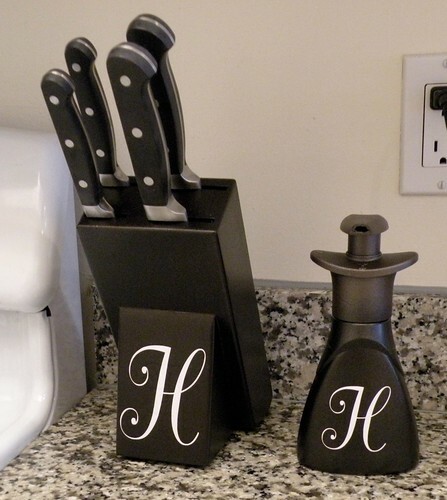 Yours looks really nice and the fact that it matches your knife block.. Cool! BUT… let us see it in a month, will you? What a great idea! I keep my soap underneath the sink because the bottle is so ugly, this is a much better alternative! Now that is an idea I never would have thought of. It looks great! You’re just too creative! Be sure to stop by AtticMag this week for a Giveaway! Oh my gosh – what a great, great idea! Those things are ugly and you’ve made it look gorgeous! Who knew?! Oh, you’re good! These look great and so elegant! OH MY!!!! I am so in love with this. And yes, I do hate just a wee bit for not being as ingenious as you with this awesome idea! I am so doing this tomorrow!!! Lady, this is one cool idea! I always want to buy those pump soaps but they are so ugly I don’t want to have it by my sink all the time! You’ve cured that now! This looks great! I just want to let you know that I did this to my soap dispenser and it lasted so like a year until I got a different one. Happy Easter! What a super fantastic idea!!! Thanks for sharing. This is now on the to-do list!! I’ve got to admit – this is genius! GENIUS! Very cool! Thank you for sharing! 🙂 Hope you can stop by when you get a chance! OMG! You are BRILLIANT! I might me getting me some of this paint soon! What a creative, clever girl you are! Thanks for sharing a project I will soon be doing! WOW! What a FANTASTIC idea! I am definitely going to try this. You are a genius! Who would have thought to do this to a soap pump? You are smart!! I love the soap container redo!!! Very ingenious. This is so cool! I just did a makeover on some plastic tubs and was not aware that they made paint for plastic. I so wish I had known that. Your soap bottle looks very chic!! Just wanted you to know that I featured you on my blog! Grab the button! That does it! I have to go get some Oil Rubbed Bronze spray paint first thing tomorrow! You are too clever and your site is just loaded with fun ideas. Love the soap pump and knife block projects. Once again, please insert a link to the Boardwalk Bragfest. Thank you. I love it–really so much better. Too bad the people that make these everyday products haven’t figured out that we want pretty. Luckily you are ingenious enough to make it work! This is such a great transformation. Makes your kitchen look that much more elegant. I want to do this now! I am featuring this as part of the Spring has Sprung Party at Fun to Craft. Come by and snag a featured button. Thanks for sharing it!! Okay, now that makes the kitchen necessary stuff goes WOW! Great job. Love it. I am going to have to try this but I don’t have an empty container just a new one. Great job. What a smart idea. No more high dollar soap bottles for me! Super cute! I have to make one. Seriously loving this! What a great! I that that every think looks better with ORB! Wow, that looks great! Thanks for joining my Flaunt it Friday party at Chic on a Shoestring Decorating. Without you my party numbers would be kinda pitiful. Thanks! This is VERY well done. I equally can’t stand these ugly dishsoap containers and something MUST BE DONE. I’m kind of against spray paint (environmental concerns)… however, the look you managed to create is awesome. Well crap. I’m smitten. And I was thisssss close to backing away from the Silhouette machine and letting is rest for a while. Thanks! Well crap. I’m smitten. And I was thisssss close to backing away from the Silhouette machine and finally letting it rest. I LOVE your crafty projects!!! Thanks for all the inspiration! I did this today and it came out wonderfully! 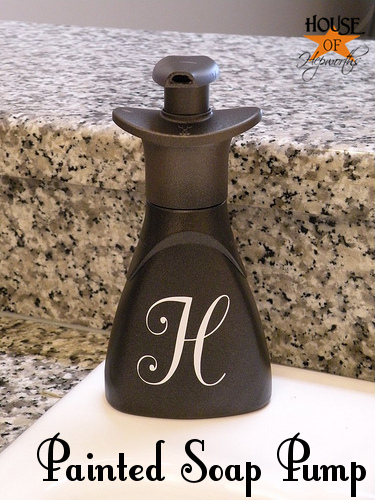 I didn’t have vinyl so I print the letter on white paper, cut it out, and Mod Podged it to the soap dispenser…easy and quick! Thanks so much!!! Wow!!! This is sooo amazing!!! I’m gonna have to try this!!! Love your blog!!!! Thank you! Have fun and remember, spray paint OUTSIDE. I learned the hard way. That is genius! Love it and I may just try it some day! I know this is the wrong place to post this but I found 2 Rodney White artwork at Craigslist..Vancouver, BC. Thought you might be interested, they are wonderful! It’s been a few months… how’s the paint holding up? Love this project! I’m thinking of making seasonal ones for our half bathroom using my Cricut to cut out leaves, snowflakes, flowers, etc out of vinyl! Thanks for stopping by my blog and letting me know where to find your project! Doing my part to right the Pinterest world. I deleted the pin I had before and reposted with your credit! Thanks! The Great Soap Makeover is a fantastic blog post. You get my vote regarding The Great Soap Makeover and I will bookmark this website now. Beautiful! I’m gonna give it a whirl too. I will say, though, that we have reused these bottles (un-beautified, just took off the stickers) for handsoap and “foamy bath soap” for the kids, and the bottles themselves didn’t hold up as well as I would have hoped. Still, even if it holds up “only” for a dozen refills, it’s worth it just ’cause it looks sooo good! I made the spray painted soap containers. Turned out cute, but could have been better. They were a little messy for my taste. Here’s the picture. I did something similar to this last week, but to my mis-matched bathroom set. 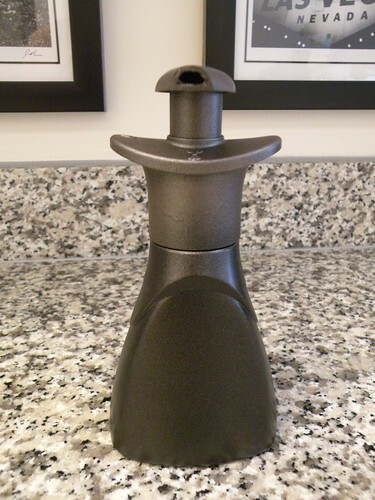 Love Rustoleum’s metallic oil-rubbed bronze! I just saw this exact identical picture on a facebook page called Totally High Maintenance. I believe she is stealing bloggers DIY craft pictures and using them to sell her version of these items in her Etsy shop. 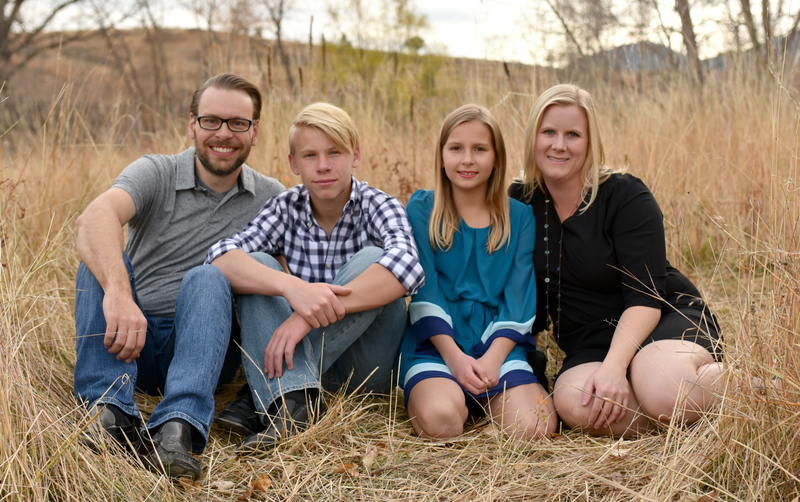 Maybe something to check into…. You are made of awesome and so is your blog. So many wonderful projects I have now. Wow, thank you! You are very kind. What size of vinyl letters did you use? are a great author.I will remember to bookmark your blog and will come back in the foreseeable future. the topic of my presentation subject, which i am going to deliver in academy. any kind of grounds seated inside the rest of the drip neighborhood and additionally causing the block. just what is the best consume of coffee minus the ideal coffee maker? of coffee beans, find your chosen cook, and discover the most perfect mixes, you need to uncover a coffee maker that will . Love this. I do have two questions though. Is the block for your knives wood or plastic? I have a wood one and would like to do the same thing. Also where can I find the letters? Any arts and crafts store should have them right? The block is wood. 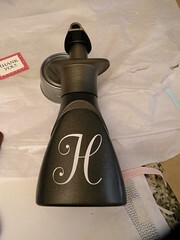 As for the letters, I ordered mine online from a vinyl shop, but I’ve seen them at craft stores. Or you can buy a stencil and just paint the letter on. Home building involves several levels and the absence of authorities may cause you needlless worries. How do you get your paint to not bubble? 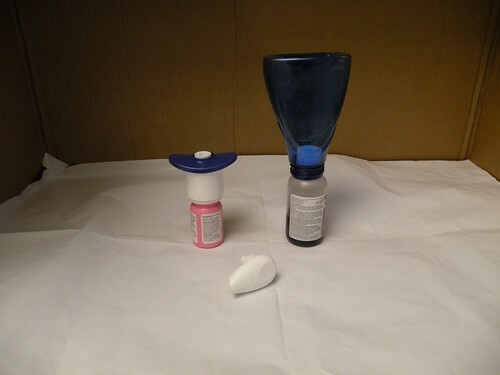 I tried the rustoleum on two different bottles, and it bubbled on both of them. 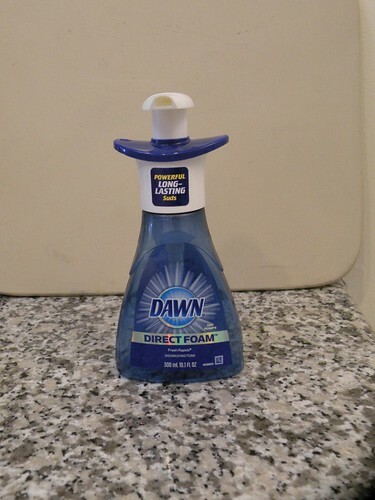 It was not a “dawn’ container, it was a “method” container and another one from the dollar store. All of it bubbled.. It is such a great idea!!!! The revisit link is bad. Would love to know how well this held up.